CW3E hosted its third annual meeting this week, April 16-19, 2018. Part of the vision of CW3E is to create a community of collaboratively-oriented scientists, students, engineers and staff, and to generate the support to enable these collaborations. This was the first annual meeting of this scope. Collaborators from all over the U.S., and National Weather Service forecasters from Reno, Monterey/San Francisco, and San Diego attended. The objectives of the meeting were to bring together scientists and engineers to address major science challenges, share ideas, develop collaborative projects, and to provide early career scientists and students opportunities to present their work. CW3E Postdoctoral Scholar, Forest Cannon, presents on airborne radar observations of oceanic precipitation in atmospheric rivers. The meeting began on the afternoon of Monday, April 16th and went through Thursday, April 19th. There was a poster session on the afternoon of April 17th, to give more post-docs and graduate students a chance to present their work. 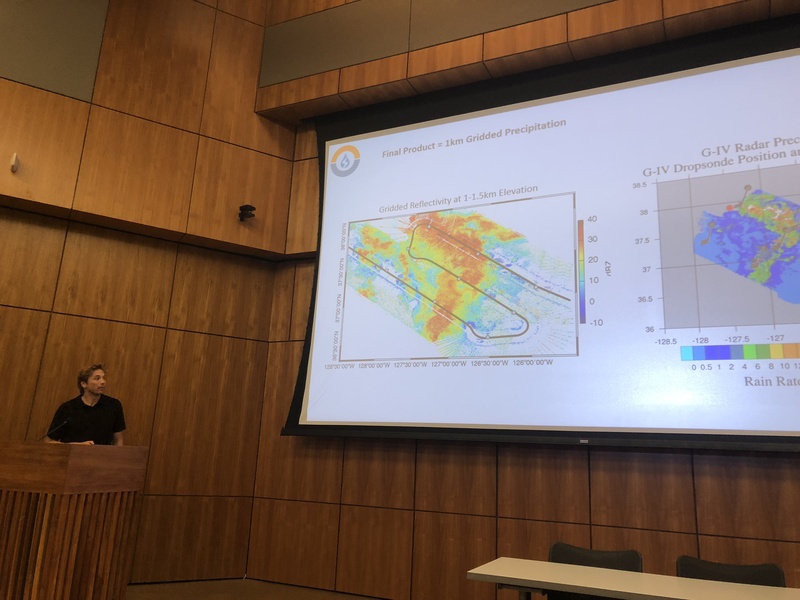 Session topics included extreme precipitation climatology and future projections, mesoscale and physical processes, forecasting, subseasonal to seasonal forecasting, AR reconnaissance and data assimilation, and hydrology and snow. There was a strategic planning session in which all attendees brainstormed and shared their thoughts on where CW3E will be in the next 5 years. Throughout the meeting there were several chances to discuss future scientific collaborations. Attendees reported how valuable the face-to-face meetings between collaborators were, and how productive it was to discuss potential research avenues in person. Although the exact form of the meeting will evolve in response to feedback, the annual in-person scientific meeting will continue to be central to CW3E’s mission to build a community of scientists and engineers working together to solve challenging problems relating to extreme weather and water events in the west.